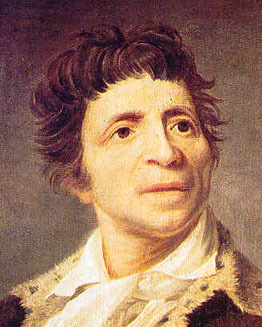 French revolutionary leader, eldest child of Jean-Paul Marat, a native of Cagliari in Sardinia, and Louise Cabrol of Geneva, was born at Boudry, in the principality of Neuchâtel, on the 24th of May 1743. His father was a designer, who had abandoned his country and his religion, and married a Swiss Protestant. On his mother's death in 1759 Marat set out on his travels, and spent two years at Bordeaux in the study of medicine, after which be moved to Paris, where he made use of his knowledge of his two favorite sciences, optics and electricity, to subdue an obstinate disease of the eyes. After some years in Paris he went to Holland, and then on to London, where he practiced his profession. In 1773 he made his first appearance as an author with a Philosophical Essay on Man. The book shows a wonderful knowledge of English, French, German, Italian and Spanish philosophers, and directly attacks Helvetius, who had in his De l'Esprit declared a knowledge of science unnecessary for a philosopher. Marat declares that physiology alone can solve the problems of the connection between soul and body, and proposes the existence of a nervous fluid as the true solution. In 1774 he published The Chains of Slavery, which was intended to influence constituencies to return popular members, and reject the king's friends. Its author declared later that it procured him an honorary membership of the patriotic societies of Carlisle, Berwick and Newcastle. He remained devoted to his profession, and in 1775 published in London a little Essay on Gleets, and in Amsterdam a French translation of the first two volumes of his Essay on Man. In this year he visited Edinburgh, and on the recommendation of certain Edinburgh physicians was made an M.D. of St. Andrews. On his return to London he published an Enquiry into the Nature, Cause, and Cure of a Singular Disease of the Eyes, with a dedication to the Royal Society. In the same year there appeared the third volume of the French edition of the Essay on Man, which reached Ferney, and exasperated Voltaire, by its onslaught on Helvetius, into a sharp attack which only made the young author more conspicuous. His fame as a clever doctor was now great, and on the 24th of June 1777, the comte d'Artois, afterwards Charles X of France, made him by brevet physician to his guards with 2000 livres a year and allowances. Marat was soon in great request as a court doctor among the aristocracy; and even Brissot, in his Mémoires, admits his influence in the scientific world of Paris. The next years were much occupied with scientific work, especially the study of heat, light and electricity, on which he presented memoirs to the Académie des Sciences, but the academicians were horrified at his temerity in differing from Newton, and, though acknowledging his industry, would not receive him among them. His experiments greatly interested Benjamin Franklin, who used to visit him and Goethe always regarded his rejection by the academy as a glaring instance of scientific despotism. In 1780 he had published at Neuchâtel a Plan de législation criminelle, founded on the principles of Beccaria. In April 1786 he resigned his court appointment. The results of his leisure were in 1787 a new translation of Newton's Optics, and in 1788 his Mémoires académiques, ou nouvelles découvertes sur la lumière. His scientific life was now over, his political life was to begin in the notoriety of that political life his great scientific and philosophical knowledge was to be forgotten, the high position he had given up denied, and he himself scoffed at as an ignorant charlatan, who had sold quack medicines about the streets of Paris, and been glad to earn a few sous in the stables of the comte d'Artois. In 1788 the notables had met, and advised the assembling of the states-general. The elections were the cause of a flood of pamphlets, of which one, Offrande à la patrie, was by Marat, and, though now forgotten, dwelt on much the same points as the famous brochure of the Abbé Siéyès: Qu'est-ce que le tiers état? When the states-general met, Marat's interest was as great as ever, and in June 1789 he published a supplement to his Offrande, followed in July by La constitution, in which he embodies his idea of a constitution for France, and in September by his Tableau des vices de la constitution d'Angleterre, which he presented to the Assembly. The latter alone deserves remark. The Assembly was at this time full of anglomaniacs, who desired to establish in France a constitution similar to that of England. Marat had seen that England was at this time being ruled by an oligarchy using the forms of liberty, which, while pretending to represent the country, was really being gradually mastered by the royal power. His heart was now all in politics; and he decided to start a paper. At first appeared a single number of the Moniteur patriote, followed on the 12th of September by the first number of the Publiciste parisien, which on the 16th of September took the title of L'Ami du peuple and which he edited, with some interruptions, until the 21st of September 1792. The life of Marat now becomes part of the history of the French Revolution. From the beginning to the end he stood alone. He was never attached to any party; the tone of his mind was to suspect whoever was in power. About his paper, the incarnation of himself, the first thing to be said is that the man always meant what he said; no poverty, no misery or persecution, could keep him quiet; he was perpetually crying, "Nous sommes trahis." Whoever suspected any one had only to denounce him to the Ami du peuple, and the denounced was never let alone until he was proved innocent or guilty. Marat began by attacking the most powerful bodies in Paris -- the Constituent Assembly, the ministers, the corps municipal, and the court of the Châtelet. Denounced and arrested, he was imprisoned from the 8th of October to the 5th of November 1789. A second time, owing to his violent campaign against Lafayette, he narrowly escaped arrest and had to flee to London (January 1790). There be wrote his Dénonciation contre Necker, and in May dared to return to Paris and continue the Ami du peuple. He was embittered by persecution, and continued his vehement attacks against all in power, and at last, after the day of the Champs du Mars (July 17, 1790), against the king himself. All this time he was in hiding in cellars and sewers, where he was attacked by a horrible skin disease, tended only by the woman Simonne Evrard, who remained true to him. The end of the Constituent Assembly he heard of with joy and with bright hopes for the future, soon dashed by the behavior of the Legislative Assembly. When almost despairing, in December 1791, he fled once more to London, where he wrote his Ecole du citoyen. In April 1792, summoned again by the Cordeliers' Club, he returned to Paris, and published No. 627 of the Ami. The war was now the question, and Marat saw clearly that it was to serve the purposes of the Royalists and the Girondins, who thought of themselves alone. Again denounced, Marat had to remain in hiding until the 10th of August. The early days of the war being unsuccessful, the proclamation of the Duke of Brunswick excited all hearts; who could go to save France on the frontiers and leave Paris in the hands of his enemies? Marat, like Georges Jacques Danton, foresaw the massacres of September. After the events of the 10th of August he took his seat at the commune, and demanded a tribunal to try the Royalists in prison. No tribunal was formed, and the massacres in the prisons were the inevitable result. In the elections to the Convention, Marat was elected seventh out of the twenty-four deputies for Paris, and for the first time took his seat in an assembly of the nation. At the declaration of the republic, he closed his Ami du peuple, and commenced, on the 25th, a new paper, the Journal de la République Française, which was to contain his sentiments as its predecessor had done, and to be always on the watch. In the Assembly Marat had no party; he would always suspect and oppose the powerful, refuse power for himself. After the battle of Valmy, Dumouriez was the greatest man in France; he could almost have restored the monarchy; yet Marat did not fear to denounce him in placards as a traitor. His unpopularity in the Assembly was extreme, yet he insisted on speaking on the question of the king's trial, declared it unfair to accuse Louis for anything anterior to his acceptance of the constitution, and though implacable towards the king, as the one man who must die for the people's good, he would not allow Malesherbes, the king's counsel, to be attacked in his paper, and speaks of him as a "sage et respectable vieillard." The king dead, the months from January to May 1793 were spent in an unrelenting struggle between Marat and the Girondins. Marat despised the ruling party because they had suffered nothing for the republic, because they talked too much of their feelings and their antique virtue, because they had for their own virtues plunged the country into war; while the Girondins hated Marat as representative of that rough red republicanism which would not yield itself to a Roman republic, with themselves for tribunes, orators and generals. The Girondins conquered at first in the Convention, and ordered that Marat should be tried before the Revolutionary Tribunal. But their victory ruined them, for on the 24th of April Marat was acquitted, and returned to the Convention with the people at his back. The fall of the Girondins on the 31st of May was a triumph for Marat. But it was his last. The skin disease he had contracted in the subterranean haunts was rapidly closing his life; he could only ease his pain by sitting in a warm bath, where he wrote his journal, and accused the Girondins, who were trying to raise France against Paris. Sitting thus on the 13th of July he heard in the evening a young woman begging to be admitted to see him, saying that she brought news from Caen, where the escaped Girondins were trying to rouse Normandy. He ordered her to be admitted, asked her the names of the deputies then at Caen, and, after writing their names, said, "They shall be soon guillotined", when the young girl, whose name was Charlotte Corday, stabbed him to the heart. His death caused a great commotion at Paris. The Convention attended his funeral, and placed his bust in the hall where it held its sessions. Jacques-Louis David painted "Marat Assassinated", and a veritable cult was rendered to the Friend of the People, whose ashes were transferred to the Panthéon with great pomp on the 21st of September 1794 -- to be cast out again in virtue of the decree of the 8th of February 1795. Marat's name was long an object of execration on account of his insistence on the death penalty. He stands in history as a bloodthirsty monster, yet in judging him one must remember the persecutions he endured and the terrible disease from which he suffered.